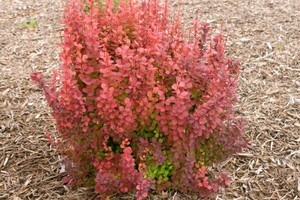 description for "Hedges: Berberis thunbergii 'Orange Rocket' PP18,411"
'Orange Rocket' Barberry An exciting barberry variety selected for its upright growth in addition to foliage colors in vivid shades of red and orange. New growth emerges radiant with orange-red tones deepening to dark red. Light yellow flowers in the spring are followed by small crimson fruit. Foliage hues intensify in fall, making 'Orange Rocket' light up the landscape. Grows to a mature height of 4 feet with a spread of 18-24 inches. Zones 4-8. Edited by M.Tate. reviews for "Hedges: Berberis thunbergii 'Orange Rocket' PP18,411"